In her programme essay for the Royal Opera's revival of Phyllida Lloyd's production of Verdi's Macbeth (here performed in its revised 1865 version), Mary Jane Phillips lists the scenic requirements that were to make the Florence premiere of the opera's first version such a challenge. The list includes 'castles, a cave, a heath, a forest, a battlefield, a "magic" chair for Banquo's ghost, trap doors, a cauldron set over a fire, thunder, lightning and a "phantasmagoria" '. A production that slavishly adhered to these requirements would, no doubt, be dismissed as hopelessly unimaginative – and, in all probability, rightly so – but it's a list that emphasises the need for at least some theatrical flair and variety. Lloyd's production, first seen in 2002, delivers only the most fleeting glimpses of the former, and a depressing lack of the latter. In Anthony Ward's designs the action is encased within dark grey bunker of bulky reinforced tiles. Two walls running across the stage – one at the back and one half-way down the stage – can be left down to increase the sense of claustrophobia or opened up to reveal ominous wintry clouds. A golden cage in the form of a cube provides a somewhat obvious metaphor for self-imposed psychological imprisonment. It is sometimes set spinning, sometimes left to move purposefully up and down the stage. That's about it, though, and as the opera unfurled the lack of variety became rather trying. The set allows a welcome fluidity to scene changes (the advantage, I suppose, of not actually changing the scene), and did, occasionally, provide moments of theatricality, such as when it enabled shards of bright light to cut across the stage for Macbeth's address to the dagger; but these were far too few. Many of the effects were half-hearted: Banquo's appearance at the non-existent dinner, the bare sticks of Birnam Wood, or the unthreatening clippety-clop horses carrying the apparitions of Banquo's line. The earnest attempt to make the witches genuinely sinister through mad gesticulation rendered their choruses camper than ever (red headdresses and monobrows also made them look like two dozen deranged Frida Kahlos), while a desire to demonstrate the Macbeth's newly won wealth saw them hampered by ridiculous, rustly bling. Revival director Harry Fehr hasn't managed to galvanise the cast as one might have hoped, either; each singer, it seemed, was rather left to his or her own devices. If the production did little to draw you into the unfurling drama, however, the musical side of the performance was often compelling. 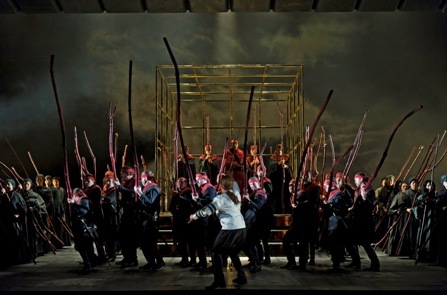 Antonio Pappano tried to weigh the opera's very first bars with a little too much gravitas, perhaps, but once he got going he conducted Verdi's score with a tangible sense of drama and fire. I wondered on several occasions if there was anyone better at bringing the composer's accompanimental figures – no great shakes on the page – to vibrant life. He elicited excellent playing from the ROH orchestra, and, often with the help of the ROH chorus on great form, produced some glorious climaxes. Liudmyla Monstyrska, having stepped in as a last-minute replacement in Aida a couple of months ago, here made an even stronger impression as Lady Macbeth, the part that was originally scheduled to be her Royal Opera debut. 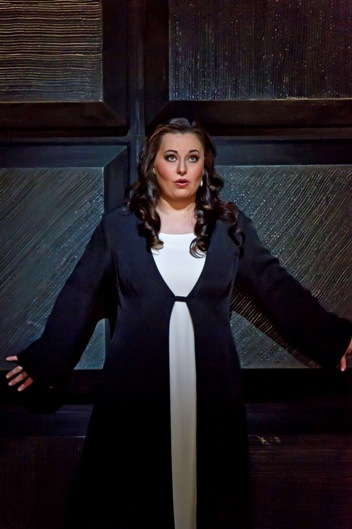 The role's slightly lower tessitura suited her better and there was no sign of the understandable nerves of her Aida. Here her voice often sounded sensational: powerful, dark in the middle range; free, rich and surprisingly agile high up. She's not the most compelling actress, perhaps, but this voice is the real deal, negotiating the extremes of this tortuous role with fearless abandon. Simon Keenlyside does not, one seems duty-bound to point out, tick all the usual Verdi baritone boxes (who does these days?). There are, of course, times when you want him to be able to assert himself over proceedings with a leonine roar, or launch a phrase with endless legato, but the voice seems more and more at home in the repertoire, and makes up in focus much of what it lacks in decibels. We also have from him intelligent acting, unfailing musicianship and a voice that has no problems with the tessitura. It seemed, though, that the production (or a recently injured arm) kept him from plumbing the emotional depths possible in the role. We were a bit short on chemistry between him and Monstyrska, too, but this will probably develop as the run progresses. The rest of the cast supported the leading couple ably. Raymond Aceto made a noble Banquo, and if his bass lacks a solid, dark core, he employs it generously, rolling out one pleasing phrase after another. Dimitri Pittas made a great sound in his brief appearances as Macduff, but was a touch overwrought with a tendency to push sharp. 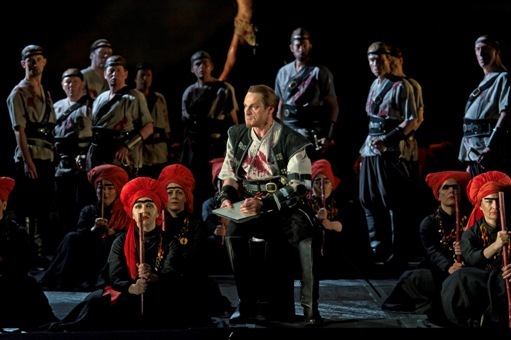 This revival is worth catching, then, for Pappano's conducting and Monastyrska's Lady Macbeth alone, and Keenlyside brings all the qualities one expects to the title role. Musically there are some excellent things; as theatre, however, it's hardly satisfying. On 13 June 2011,Macbeth will be broadcast live into over 450 cinemas around the world, including the UK, Italy, Austria, Croatia, France, Germany, Malta, Latvia, the Netherlands, and Spain. For full details the Royal Opera's dedicated web page.